FLANGE, COLOR AND DRAWTUBE LENGTH Choose an optionWE WILL CONTACT YOU FOR THESE CHOICES. THE PRICE STAYS THE SAME. 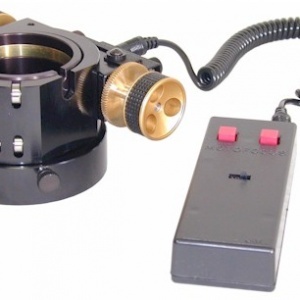 The modular design of the MOONLITE CSL FOCUSER 2.5″ FOR SCT & RC makes it very versatile. Just pick the options you need in these 4 categories: Flange, Drawtube, Focus knob/motor, and Color. 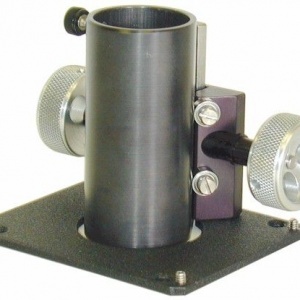 The CSL is a heavy duty 2.5″ larger format focuser design using a double bearing crayford configuration. 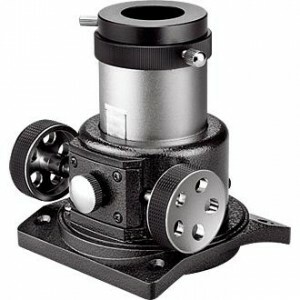 The double bearing high pressure design allows the crayford focuser to handle greater load capacities over the the regular CS 2″ model focuser, making it ideal for large imaging set ups. We offer everything from our heavy duty tri-knob reduction unit with shaft lock system to different types of motor options for both visual or imaging configurations. Our “High Res” stepper motor options use PC based interfaces, providing automated focus ability running today’s ASCOM software. Different draw tube travels and configurations are available. Our collimatable mounting flanges provide flexibility for achieving perfect mechanical centerline collimation should the need arise. 6 Custom anodized colors are available. A motorized rotating flange option will be offerd as a customer installed add on later this year. MoonLite manufactures many flanges that fit a variety of different SCT, RC, and Vixen OTAs. Please use the pull down menu to select the flange located at the bottom of this page. All current CSL flanges feature a 2 piece rotating flange design with a lock knob providing camera angle adjustment. It consist of an upper flange part and a lower flange part on a rotatable radial dove tail design. The upper flange part bolts on to the focuser body with 3 bolts. The lower flange part has the threads pattern that matches the visual back and connects in to the upper flange. The thickness and diameter of the lower flange is designed for the telescope it is to be installed on. This 2 part rotating flange system provides collimation ability using a simple 3-point push pull bolt/setscrew arraignment. Please note all focusers are factory collimated dead on before we ship them, and do not require any adjustment. The only time collimation should be changed is if the OTA has some kind of defect causing the focuser to set slanted on the tube. In this case the focuser’s collimation ability would come in handy to correct the mechanical centerline collimation of the OTA in question. Flanges can be swapped on the bottom of the focuser so it will fit different OTAs. Replacement bottom flanges are sold separately for $95 if you need a different flange at a later time. The flanges come in 8 thread sizes for SCTs and RCs. The 3 1/4″ Celestron thread size, 3 1/4″ Meade thread size, 4″ thread size for Meade 16″ scopes, RC 6″ / 8″ thread size, RC 10″ / 12″ thread size, and Vixen 260L thread size. The 3 1/4″ Celestron threaded flanges fit 11″ and 14″ Celestron visual backs. The special taller EDGE flange fits the new 11″ and 14″ Celestron Edge scopes. We make a special EDGE flange for the 9.25″ EDGE that has a cut shape on the bottom to clear the mirror focus knob. The 3 1/4″ Meade threaded flanges fit Meade 10″ ,12″ and 14″ Meade Visual backs. Please note; The CSL large format focuser is not intended for the smaller 8″ SCT scopes due to the small 2″ SCT threaded visual back. Please look at the CS 2″ format size focuser for all 8″ SCTs with the smaller visual back thread size. It is important to pick a matching drawtube and flange combination when configuring the MoonLite focuser. We recommend the drawtube length for each flange listed below. The 3 1/4″ Celestron thread regular profile flange fits 11, and 14″ Celestron SCTs. It is rotatable and collimatable. The correct drawtube length for this flange are any of our 1″ travel versions, including the sliding focal reducer adjustable position drawtube. The The 3 1/4″ Meade thread regular profile flange fits 10, 12″, and 14″ Meade SCTs. It is rotatable and collimatable. The correct drawtube length for this flange are any of our 1″ travel versions, including the sliding focal reducer adjustable position drawtube. 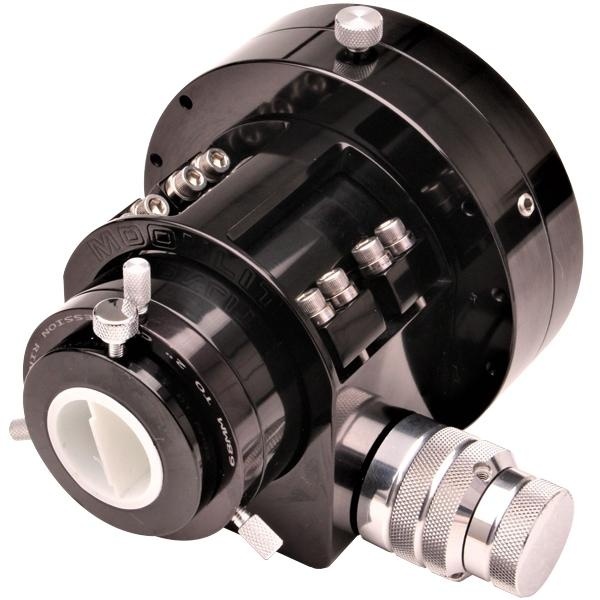 The large 4″ Meade thread flange fits only the 16″ Meade SCTs with the 4″ visual back. It is rotatable and collimatable. The correct drawtube length for this flange are any of our 1″ travel versions, including the sliding focal reducer adjustable position drawtube. Vixen flange fits the VMC260. The correct drawtube length for this flange are any of our 1″ travel versions. The 3 1/4″ Celestron thread EDGE flange fits the EDGE 11″, and 14″ Celestron SCTs. It is rotatable and collimatable. The correct drawtube length for this flange are any of our 1.5″ travel versions. This flange is slightly taller then the regular Celestron flange above to provide the ideal spacing / profile if the new EDGE Focal Reducers are used. Please note the EDGE focal reducers do not fit inside the focuser. The focuser threads on to the Focal reducer for all of the EDGE model scopes. The longer 1.5″ travel 68mm thread top drawtube is the popular and best match for this flange. The EDGE 9.25″ flange is tall like the regular EDGE flange above, but has a special machined shape at the bottom to provide clearance around the Mirror focus knob on the visual back. The correct drawtube is the 1.5″ travel 68mm thread top when picking this flange. RC 6″ / 8″ flange fits the threaded visual back on RC8″ and RC6″ scope. It also fits the AstroTech, Orion, and GSO versions of the RC OTAs. The flange is rotatable and collimatable. The correct drawtube length is the 1.5″ travel versions. This focuser threads on to the included spacer flanges that Astrotech provides to adjust the mounting position. However the longer 2″ travel drawtube can also be picked if more out travel is needed for imaging set ups. RC 10″ /12″ flange fits the threaded visual back on RC10″ and RC12″ scope. It also fits the AstroTech, Orion, and GSO versions of the RC OTAs. The flange is rotatable and collimatable. The correct drawtube length is the 1.5″ travel versions. This focuser threads on to the included spacer flanges that Astrotech provides to adjust the mounting position. However the longer 2″ travel drawtube can also be picked if more out travel is needed for imaging set ups. Please note that the EDGE focal reducers are designed to be installed directly on the back of all EDGE scope’s visual back, then the focuser is installed on to the focal reducer. The EDGE distance spec of 147mm for the focal plane is the same with or with out the reducer installed. So the focuser will work fine installed on the reducer or directly on the back of the scope. 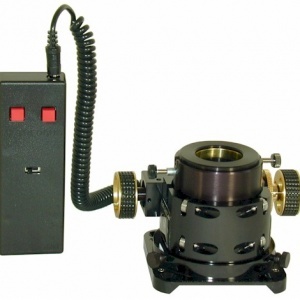 Two focuser configurations can be picked for the EDGE 11″ and 14″ scopes. The tall EDGE flange version with the 1.5″ travel drawtube, or the shorter 3 1/4″ Clestron thead regular profile flange with the 1″ travel drawtube. 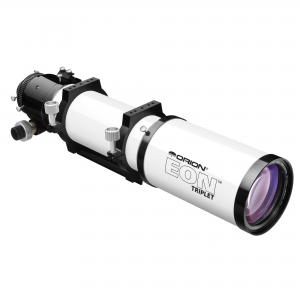 The tall version of the focuser provides focus range to meet the EDGE’s 147mm spec with a typical CCD camera. 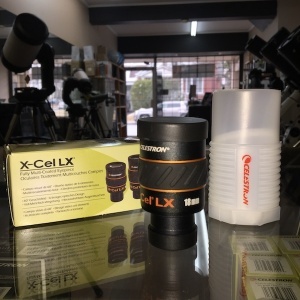 However if a Filter wheel or other item is to be used, then the shorter profile 3 1/4″ Celestron regular flange may be a better pick to provide more room for a thicker filter wheel/camera set up. Please note: Fork mounted SCTs may have limited clearance with the focuser swung down into the fork area. Please consider any clearance issues before picking a focuser. Draw tubes: MoonLite offers 3 different drawtube travel lengths for the CSL large format focuser. 1″ travel, 1.5″ travel, and 2″ travel. Those travel length drawtube come in 2 different styles, 3 thumbscrew compression ring version and the new 68mm thread top version. The 1″ travel drawtube size is also offered in a focal reducer version that allows the focal reducer to be installed inside the focuser. It is a sliding holder system that allows the focal reducer position to be be adjusted inside the focuser. We make 3 different sliding holders at this time. One holder is supplied free when this drawtube is selected. Customers requiring heavy load capacity or a permanent configuration can pick our new 68mm threaded drawtube option. 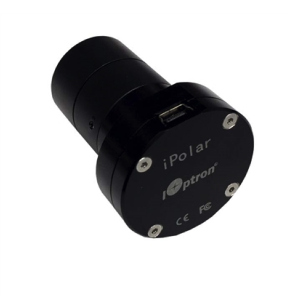 It provides a very rigid, no sag solution for imagers using heavy loads. The 2.5″ format drawtube has a female 68mm x 1mm female thread in the top allowing any of our matching 68mm threaded tops to be installed. A 2″ 3-thumbscrew brass comp ring adapter and a 1.25″ brass comp ring adapter automatically come with the threaded drawtube option. However, we also make other thread-in 68mm male thread adapters such as a T-thread adapter, STL-thread adapter, SCT-thread adapter. This is the most popular drawtube style we make and is recommended for all of our larger format focusers. Customers still get the 3 thumbscrew comp ring thread in tops with this drawtube pick, so it makes sense to pick the 68mm version of drawtube. However if you want to use existing 2.5″ smooth bore adapters from another focuser, then the original drawtube version may be the best pick. All SCT customers should pick one of the 1″ travel drawtubes as that length is a match for the flanges. RC customers should pick the 1.5″ travel size drawtubes, or if a spacer is being used, then the 2″ travel drawtube will work. Vixen 260 users should only pick the 1″ travel drawtube as that is the only one that will work with the 260 flange we offer. MoonLite has many knob and motor configurations. Our reduction systems and motor options are integrated into the focuser at the time of assembly. However we do offer new motor install kits now so a motor can be added easily at a later time by the customer. Please use the pull down menu located at the bottom of this page to select the configuration you need. Standard dual rate -The standard CSL comes with our heavy-duty 1.5″ Dual rate Tri-knob option. It is a dual rate (2 speed) configuration using our extremely smooth 8 to 1 reduction unit. It uses large 1.5″ OD knobs and has both a coarse and a fine knob on one side and a coarse on the other. The larger tri-knob option is a heavy-duty version of the regular dual rate system found on our smaller CS focusers and has increased lifting capacity to 6 lbs. This is a good choice for a large SCTs/ RC or heavy loads. The fine focus adjustment knob is on the right by default, but can be made a lefty if needed. Dual rate Tri-knob w/ Shaft Lock – The dual rate with SHAFT LOCK knob option adds the shaft lock system to the coarse side knob. The shaft lock option uses a unique mini brass compression ring clamp sub system that allows the user to lock the shaft and focuser’s position with out deflecting the drawtube. This type of focus lock is much better then the old “thumb screw against the draw tube” style that would shift the image when pressed against the draw tube. 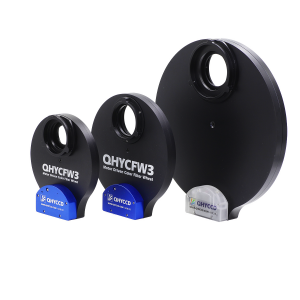 The shaft lock ability along with the 6 lb heavy-duty reduction unit make this option ideal for heavy demanding loads for both visual and imaging requirements. The fine knob is on the right by default, but can be made a lefty if needed. The whole point of the shaft lock option is to precisely lock focus position with no shift in image or change in focus. MoonLite offers ASCOM drivers to run with your existing imaging software, and a simple non ASCOM program for customers not running a full blown ASCOM automated system (for someone who just wants a simple automated control app to run the focuser). See the Download tab on our Web site for Software. Please note: Motor kits can be added at a later time, as we sell motor kits that customers can install themselves. The amount of slip can be adjusted on the new slip clutch by adjusting the tightness of the slip clutch ring. For manual knob operation of the focuser, turn the silver knurled ring loose. For motor operation of the focuser, tighten the silver knurled ring. To adjust the knurled rings tension, it helps to hold the manual knob still with your right hand and turn the clutch ring with your left hand. Holding the manual knob in place will keep the shaft from turning allowing the clutch ring to tighten / loosen the clutch. Note: Note: No damage will be done if the focuser motor continues to run past the mechanical stops of the drawtubes travel. Even if the clutch is tight, it will simply slip when the travel runs out. Lifting Capacity: The drawtube pressure can be adjusted to each user’s preference. Increasing the pressure increases the load capacity (vertical lifting capacity) of the focuser. Decreasing the pressure lowers the load capacity but gives the focuser a smoother focusing action. We set the focuser at approximately 6 lbs. at time of assembly; however, you can adjust it to be less or more depending on your specific needs. The ideal setting is to have it adjusted so the focuser can hold the heaviest load presented without slipping and requiring no additional force. This will give the focuser the best feel and still provide the vertical lifting capacity required. To adjust – turn the aluminum thumbscrew located between the two setscrews on the bottom of the focuser CW to increase load capacity. The aluminum thumbscrew can only add pressure, not take away pressure. This is due to the 2 setscrews on each side of the thumbscrew applying a minimum set pressure amount. In some rare cases, it may be necessary to do a coarse adjustment by turning the 2 setscrews located on each side of the aluminum thumbscrew (1/8 allen wrench) a very small amount. Normally, 1/20 of a turn or less should be made on the setscrews in a CW direction, then check the lifting capacity pressure by racking the drawtube up and down. Collimation: To adjust collimation, turn the 4 mini setscrews located in the top part of the 2-part flange. A small amount of tip/tilt (.015 max) can be made by adjusting the setscrews. 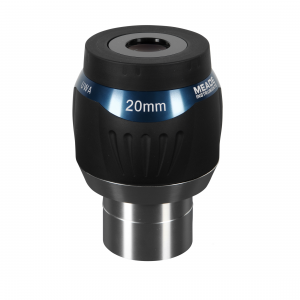 We collimate each focuser before shipping it so no adjustment should be required; however, if collimation is required due to some sort of visual back defect when the focuser is installed, then the tip/tilt ability will come in handy. Please Note: rotating the focuser will throw off collimation reference once the flange is tilted off plane so please do not collimate the focuser off center line unless it is absolutely necessary to fix a gross error in the OTA. WE WILL CONTACT YOU FOR THESE CHOICES. THE PRICE STAYS THE SAME.